Last week, the Russian military conducted weapon drills involving its strategic nuclear forces and high-precision long-range weapons, according to TASS. The aim of the military exercise was to test the combat readiness of Russia’s nuclear triad. “In general, the results of the drills demonstrated high combat readiness of strategic nuclear forces and high-precision long-range weapons,” Defense Minister Sergei Shoigu said on Tuesday. Units involved in the military exercise came from Russia’s Southern Military District, Northern and Pacific Fleets, Caspian Flotilla, Aerospace Defense Forces and Long Range Aviation. Among other things, the drill included the test-firing of a single-warhead RS-12M2 ICBM (Topol-M missile system)–the mainstay of Moscow’s future Strategic Missile Forces (RSMF)—from the Plesetsk cosmodrome. In addition, according to TASS, Tu-160 strategic bombers fired guided missiles at targets at the Pemboy and Kura training ranges in northeastern Russia and on the Kamchatka Peninsula in the Russian Far East. Two Delta III-class and Delta-IV-class submarines fired ballistic missiles from the Barents and Okhotsk Seas. According to information obtained by the Washington Free Beacon, the missiles test-fired included an SS-N-18 submarine-launched ballistic missile, an SS-N-23 SLBM, and the SSN-30A Kalibr long-range ship-fired missile, first used by Russian forces last month in Syria. 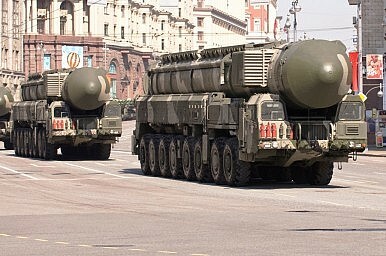 The new weapons will in all likelihood be RS-24 Yars (SS-27) rockets, Russia’s newest operational fifth-generation intercontinental ballistic missile (ICBM), which can carry multiple independently targetable nuclear warheads and was first introduced into service in July 2010. Russia is in the middle of modernizing its strategic and nonstrategic nuclear warheads. According to the Bulletin of the Atomic Scientists, Moscow has currently 4,500 nuclear warheads, of which roughly 1,780 strategic warheads are deployed on missiles and at bomber bases. An additional 700 strategic warheads are kept in storage along with approximately 2,000 nonstrategic warheads. Russia has around 311 ICBMs deployed capable of carrying 1050 warheads. Russia is in the process of retiring all Soviet-era ICBMs and replacing them with new weapon systems, a project that is about halfway complete. However, the modernization push may be difficult to sustain, least of all because of the financial costs involved. Despite sanctions, the Russian defense sector is booming.